Blueair is designed, engineered and built for people who expect the very best and don't want to compromise on health, design or function. The Blueair system housing is made of galvanized steel, rather than less durable plastic. The fan and blower are manufactured by EBM, a maker of telecom and medical equipment. Blueair systems offer an exceptionally long product life and carry a 10-year limited warranty. Low energy usage, Blueair1s phenomenally low power usage means you can run the system 24/7 without a jump in electricity consumption. In fact, it costs about the same to clean the air in your home as it does to power a single lightbulb: only 15 watts on low to 95 watts on high. 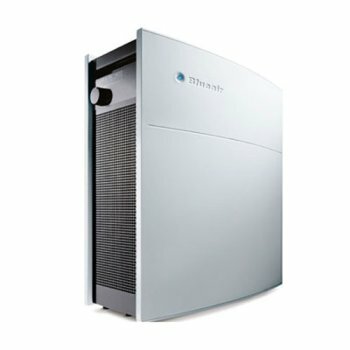 Cleans air quietly, sophisticated materials and precision engineering allow Blueair to clean indoor air without the noise associated with less advanced units. On the lowest setting, the units emit no more sound than a desktop computer. To achieve exceptionally quiet operation, Blueair1s patented HEPASilent filter technology traps particles two ways: with mechanical and electrostatic filters. Relieve allergies, asthma, or other respiratory conditions. Captures 99.97% of 0.1 micron particles, including allergy-provoking pollen, dust mites, etc. 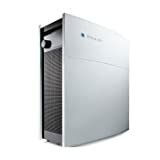 This same filter technology earned Blueair units Best of Class ranking in independent testing. Warranty: 10 years on all parts and labor. 30 day Money Back Satisfaction Guarantee and 10 year warranty.